For me, food has always been more about joy than health, so I was happy as I turned the pages of this hefty read to find much talk about the enrichment of the soul. Although the gentle, far-from-preachy voice of the author takes us through the many food paradigms of the diet world (finally! ), acknowledging its myriad confusing contradictions, the term “nutrition book” would be a misnomer for this one. Its scope is much broader, linking the way we eat to as many avenues of life as you can think of. Everything about Soul-Full Eating is comforting, which makes it a good one to keep around rather than reading once and tossing. What if, when sitting down to your sumptuous meals, considering that tray of delightful d’oeuvres or decadent deserts, you realize that it is actually possible to Eat your way to Enlightenment? There are so many obvious ways we can miss the opportunity to live a supremely fulfilling life. But what surprises most people is that fulfillment can be found through eating… that is, when you are choosing foods which resonate with your Soul! Finally, a chance to navigates the vast (often contradictory) wealth of both traditional and modern nutrition advice while simultaneously honoring your unique singularity. 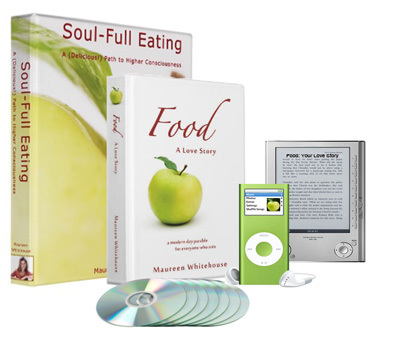 Because author, Maureen Whitehouse believes in only one nutrition axiom: “Eat with love what’s grown with love, prepared with love, and served with love,” this isn’t about fitting your body into the perfect size, or diet, or worldview. Guided by Maureen’s extensive, hands-on nutrition knowledge, learn how to integrate and apply the principles of many traditions to create a lifestyle that’s right for you, while deepening your spiritual connection on a daily basis. Not only will your health transform, but you’ll walk away with a profound knowledge of self-love, viewing food not just as a way to fuel and nurture your body, but as a connection to your community, the world around you, and your Soul. Maureen also speaks on a variety of other important and inspiring Soul-Full topics. Click here if you would like to see what other subjects you can bring Maureen in to present to your company, group or organization.